BC Semi Pneumatic Wheel 8"x 2-1/2"
Ball Bearings 1/2" I.D. Ball Bearings 5/8" I.D. Ball Bearings 3/4" I.D. 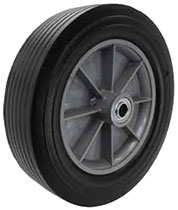 BuyCasters.com Semi Pneumatic Wheels (Centered Hub) are eco-friendly and are made from recycled rubber tires, molded to thermoplastic cores. Solid rubber tread offers many of the same advantages of pneumatic tires, without the possibility of going flat. These wheels provide excellent shock load protection, a smooth cushioned ride, rolls easily over debris and small obstacles. Wide, soft tread face is ideal for rolling on grass, sand, dirt, etc. UV Resistant; great for outdoor environments. Perfect for hand trucks, dollies, carts & mobile equipment such as generators, lawn & garden equipment, etc. *Default is 1/2" I.D. Ball Bearing (Fits 1/2" Diameter Axle) Other Bearing Options Available.